Painting of Kim Thompson by Felix De La Concha. I didn’t grow up in a household full of books. My dad never finished college, my mom never finished high school, and neither of them were readers. Buffalo libraries were terrible. The collections were old and small, and budget cuts during the inflationary ‘70s limited my local branch to 30 open hours a week, most of them happening while I was in school. I was forced to help my brother with his paper route, and use the cash I made each week to buy books to read. 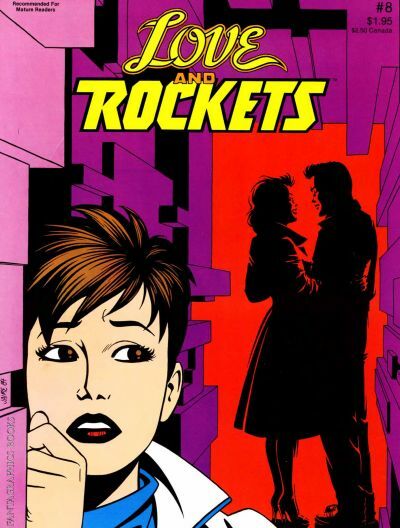 My lifelong reading habits—pulp like Doc Savage and Perry Rhodan, and of course comic books—were shaped by how dirt cheap genre paperbacks and comics were. I wanted to get maximum reading for my money. I kept buying comics, and one day on a whim I also bought a copy of The Comics Journal. (I’m sure I thought, “Hey, here’s a magazine about comics, and I like comics, so…”) My first issue was #69 (December 1981), which featured an awkward cover painting of Dr. Strange and Clea, a long interview with Marvel/DC scripter Gerry Conway, and obituaries for two artists I didn’t know, Russ Manning and Wallace Wood. Reading that issue of the Journal, however, was as bracing as a slap across the face: I remember in particular a raw review of Bruce Jones and Brent Anderson’s Ka-Zar the Savage by J.J. Pierce. 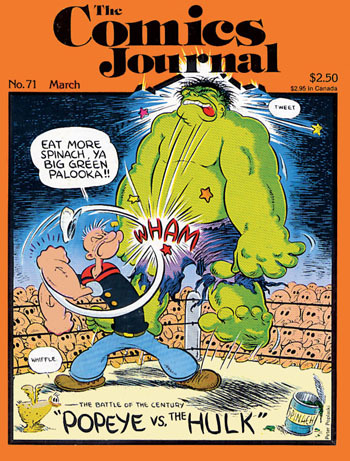 This was no wallow in lowbrow pleasure: the men who edited the Journal (and they were all men, back then) thought seriously about comics, and prodded the medium to live up to some nebulous standard of aesthetic quality. I must’ve been intrigued, since I picked the next issue I saw at the local comic shop (#71, March 1982), and was amazed to read a long debate (between R.C. Harvey and Gary Groth) over the merits of Frank Miller’s Daredevil, a comic I uncritically worshipped at the time. I remained intrigued enough to buy every subsequent issue of the Journal since, up to the current book-sized #302 (2013). I read countless Journal articles referencing the work of Will Eisner, Harvey Kurtzman and Robert Crumb, so I hunted down and read the work of these artists. I read a positive Journal review of Harvey Pekar’s American Splendor #8, so I bought that issue of Splendor, wrote to Pekar, and drove to Cleveland to meet the man in the mid-1980s. Eventually, I’d write for the print Journal myself a few times, and I currently write an intermittent column for the updated-five-times-a-week TCJ website. I’ll always be grateful to the men and women who edited the Journal and gave it its confrontational yet thoughtful vibe. Every time we read and discuss a chapter of McCloud, I also have my students read the same graphic novel, over and over again, eight times. That way, they develop a deep knowledge of at least one book, and hopefully also a sense of how McCloud’s concepts (and the other critical ideas I drag into class) can be used to increase our understanding of real-life, out-there-in-the-wild comics. For me, the graphic novel that works best in juxtaposition with Understanding Comics is Jason’s Hey, Wait… (American edition, 2001). Wait is short, easy to read multiple times, and crammed full of examples of McCloudian form; you can discuss about how Jason’s anthropomorphic characters encourage identification, and there’s a heartbreakingly poignant example of aspect-to-aspect panel transitions about halfway through the book, right after the six black panels representing Bjorn’s death. And students love to debate the ending of the book. Has Jon rewritten history to bring Bjorn back to life, while obliterating his own adulthood? Has Jon died? It doesn’t hurt that Hey, Wait… is magnificent. I adore Hey, Wait…, my students find it both confusing and moving, and it works great in class. I’m grateful to Jason for writing and drawing Hey, Wait…, and for all his subsequent books, and I’m also grateful to the man responsible for translating Jason’s work into English and for making it available to U.S. readers, especially my students. Huet’s widening stare reveals his impotence, hopelessness, anger and outrage. (Did I have to open my eyes that wide to take in the horror of the Abu Ghraib torture photographs?) 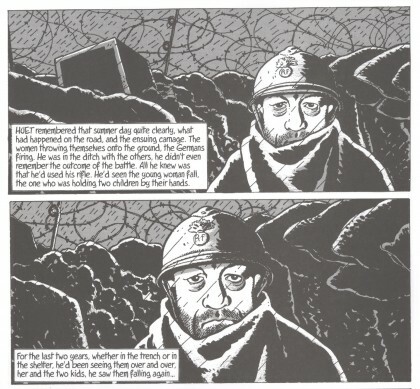 I’m grateful to Tardi for all his World War I comics, and I’m grateful to the man who’s made so many Tardi books (anti-war and otherwise) available from Fantagraphics. 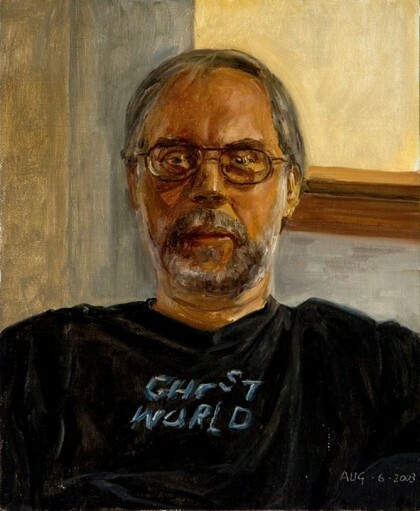 Lovely remembrance Craig and one touching on all the aspects that made Kim Thompson such a vital force in comics. Both the world and this industry is poorer for not having him hear anymore. I hope that someone follows his example and continues to translate such important European creators with such care and passion as he did. 1. Amazing Heroes–the Fanta mag that treated superhero books seriously and expected more from their creators as well as their readers. 2. Kim’s presence on the old (and lamented ) TCJ Forum. I “got into it” with him a few times and though he was opinionated, he was never disrespectful or condescending to me. 3. But most of all– The complete run of Hal Foster’s Prince Valiant in affordable editions. The 1st crown jewel in my strip collection! 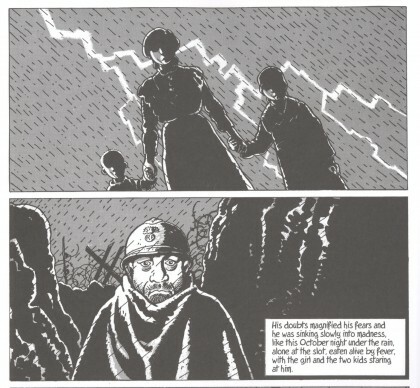 Tardi and Jason and the Ignatz books are gravy– but what a savory sauce they make!! Thanks, guys. Dan, like you I’m hopeful that the Fanta translations will continue. And Andy, it’s an indication of the breadth of Kim’s career that we can talk about so many different areas of comics culture he influenced, no? Hey, Wait… is a heartbreaking book, in the best sense of the word, but coupling it with Understanding Comics for inbtructional purposes is just brilliant. Bravo, sir. Lovely memorial. HEY, WAIT… is one of my favorite comics. Magnificent. It’s a pleasure to teach it.